Since my kindergarten class tossed up their caps at graduation nearly two weeks ago, I have been, erm, adjusting to life with my younger, smaller, less-advanced K-II class. Gone are the days where my little ones could write better than my second graders! Sigh. 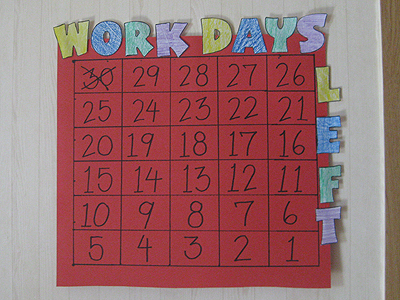 So to help with the new challenges new classes (including an extra one every day) bring, I made a “work days” countdown calendar so that I would have something to look forward to after all of the crying, hitting, yelling, sneezing, injuries, laughs, tests, sentences, Reading Street stories, stickers, and science experiments every day. At least my new class is allowed to do crafts! I didn’t include the weekends because, as much as I miss California and can’t wait to bite into a decent burrito, I love my weekends here in the ‘Ju, and the quality time with the people I’ll miss. It’s just the whole “being a teacher” thing that sometimes makes me want to rip out my hair. Only 29 28 more days of working left before laying out, sunshine, sleeping late and spring produce take over my daily routine.